There is something about watching thousands of Canada Geese converge at the same place at the same time that is simply magical. Which is why you should take my suggestion and share that magic with someone special in your life. 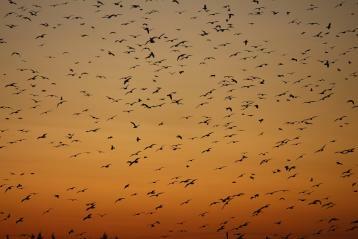 Here’s why my date night during a Sunset Goose Flight at FortWhyte Alive was so perfect. Watching the sunset has long been a romantic staple. 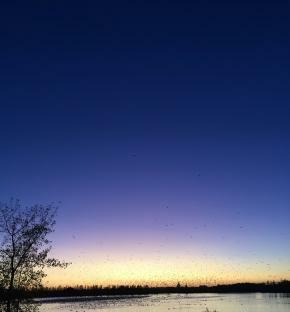 And the sunset over Lake Devonian at FortWhyte Alive certainly lived up to expectations. 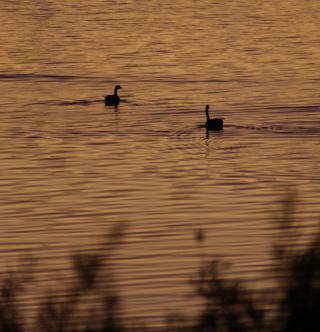 On a clear fall evening, the sky was painted in a brilliant palette of oranges and golds. And then when the sun finally dipped behind the horizon, the dark gently descended like a velvet drape, with rich blues and soft purples. 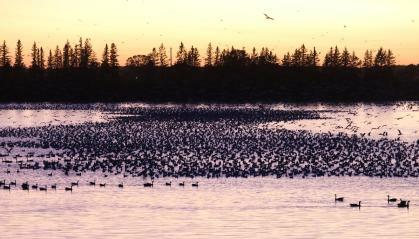 And even though the sunset was incredible, it was only the backdrop to the real show: thousands of migrating geese, gulls and birds that come to rest on the water after a day spent feeding. These geese and other birds are getting ready to migrate south for the winter and FortWhyte Alive is an important staging area — an area where they come to gather in flocks, where there is protection in numbers. About half an hour after the sun set, the show started. The first wave we saw land on the water wasn’t the geese we expected, but rather the common Ring-billed Gull. We also saw Double crested Cormorants hanging out on a tree next to the lake. 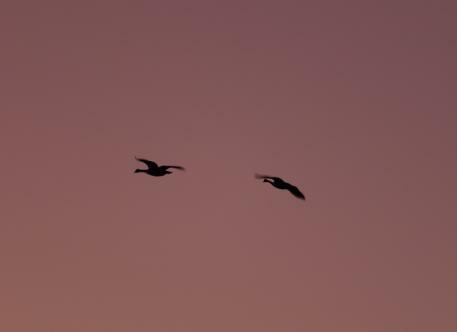 In a thrilling domino effect of wings, we watched the gulls take off and make way for the star attraction that we could hear in the distance: flocks of Greater Canada Geese – up to 15,000 of them descending en masse. While it isn’t out of the ordinary to see Canada Geese — there are about 100,000 in Winnipeg after all — we certainly weren’t used to seeing them like this. It was pretty incredible. After the sun sets, even on the warmest of fall days, there is always little chill to the air. 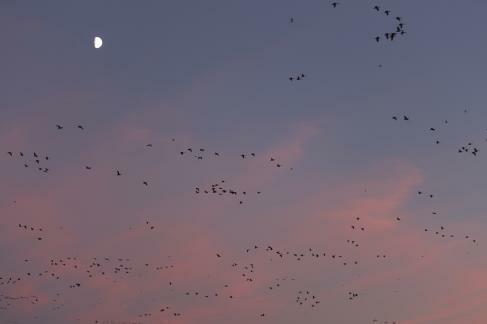 Watching the evening goose flights is the perfect opportunity to cuddle up and have a conversation. And if you really need to get warm, then head over to the bonfire. We cooked bannock over the fire, the flaky dough filled with a variety of topping options. 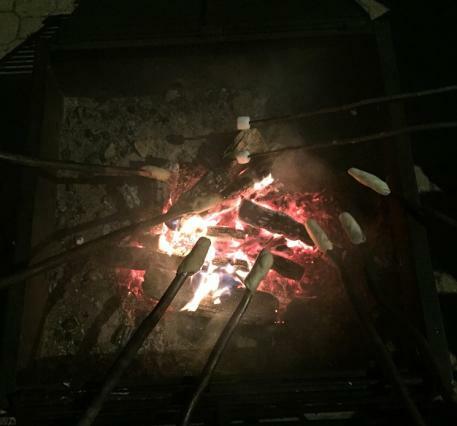 Or you can roast marshmallows for s’mores, that classic bonfire treat. 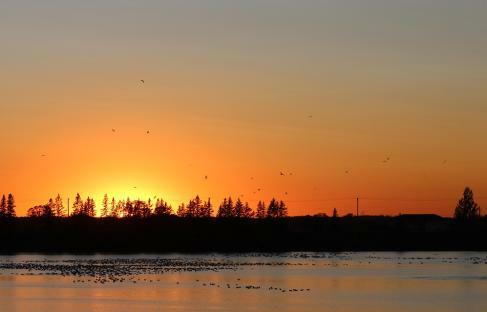 A date night at FortWhyte’s Sunset Goose Flights can cost as little as $10. From Wednesdays to Sundays until October 22, entry after 5:00 pm is only $5 per person or $20 per car load. So even if you can’t find a babysitter, bring the kids! 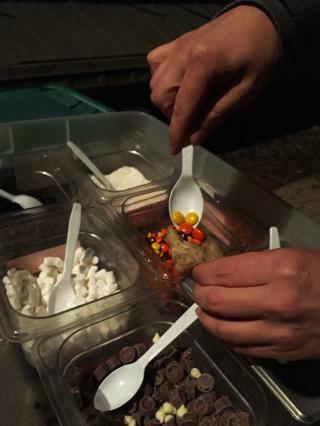 The concession offers a variety of food options, including hotdogs, veggie burgers, popcorn and cookies. You can even enjoy a beer or a glass of wine. Tickets for bannock and s’mores are only $2 each. And adding to the atmosphere on our Friday night date was the music of local band House Hand Shake. The next scheduled performance is by Skylar Bouchard on Friday, October 13. Or you can even opt to take your date up a notch (do you have a special occasion coming up?) 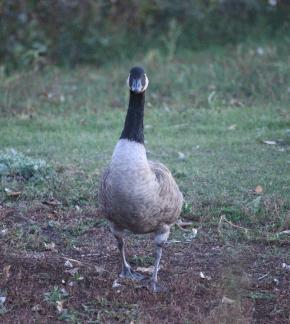 and reserve your table for a Goose Flight Feast at FortWhyte’s Buffalo Stone Café. For only $51.75 per person, you can take in the scenic views while enjoying a three-course dinner prepared by the chefs of Diversity Foods.